Quantix | How Do You Motivate Your Employees? 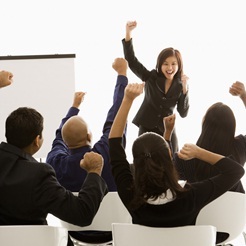 11 Jun How Do You Motivate Your Employees? I’ve been managing technical recruiters for almost 10 years now (wow…time really flies!). I’ve tried, succeeded, failed, brainstormed and collaborated on what might be the best ways to motivate the recruiters with whom I’ve had the pleasure of working. 1) Set attainable goals. Yes, you want to stretch your employees and make them strive to achieve. But nothing is less motivating than a goal that is largely unattainable. I’ve seen quarterly goals set at numbers that no one has ever achieved in the history of the company. Sure, SOMEONE might someday get to that number, but it’s better to set the goal right at the top of what someone has actually done before. You can always move the target up a little next year. 2) In setting your goals, sit down with each employee and show them exactly how they can get to that goal. For me that means breaking tasks down to the daily level. The best example I can give is this: Many sales-related positions are given annual goals – bring in $2 million in revenue – and turned loose. Many managers give no thought to helping their employees determine what is needed to be done every single day to get to that goal. Daily goals are much easier to see, measure and attain than some abstract annual goal floating out there. 3) In sales-related positions, if you want to motivate certain behaviors, attach money to that behavior. The whole “it-would-be-great-if you-did-certain-things” disappears quickly if the monetary rewards you set aren’t exactly in line with those “certain things” you want done. I’ve seen environments where the money actually rewards the opposite of the behavior that upper management says they want…and guess which behaviors occur most. I’ll give you one guess. 4) Have measurables! Seems obvious, right? But there are environments where nothing is measured, and employees goals are more based on “a gut feeling” than anything else. If you can’t actually tell what someone is doing through each step in the process, how can you help them get better? Perhaps there is some specific knowledge you could impart that would take your sub-par employee to new heights. Only if you didn’t measure performance, all you’d see is they didn’t hit their annual goal, and you’d have no idea why. That isn’t going to help you improve that employee’s performance, or if you must let them go, their replacements. 5) Make your workplace FAIR. There’s two parts to this: 1) Don’t expect anything from your employees that you don’t expect from yourself; and 2) Make it an even playing field for your entire team. Also seems obvious, but it isn’t always there. If you asked me which one of these seemed to work the best, I’d say #2. If you can tell someone exactly what they need to do every single day to get to their goal, it’s easy to tell if they’re doing those things, correct the behavior and help them achieve.